I really liked the Harkive idea of trying to catalogue how people listen to music these days. You can, of course, click on the link but for the lazy; they asked people all over the world to submit a whole days worth of music listening stories. It looks like people have contributed in many different ways. I decided to write it all down here. This is less about what I’ve been listening to and more about how I listen to things and, more importantly, how I seem to be able to keep a really accurate record of what I listen to with no effort. One of the things I noticed on thinking about the 9th was trying to make a really conscious effort to not listen to things I wouldn’t ordinarily listen to, that turned out to be quite hard. I also noticed that other people have made an effort to keep a record of extraneous music they listened to; I haven’t done that, I’ve kept to stuff that I sort of chose to listen to. So starting the day I ended up listening to Sean Keaveny on 6 Music whilst I was having a shower. 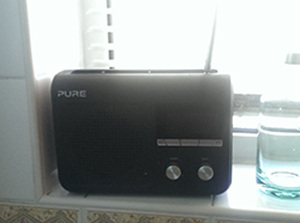 We’ve got a little Pure Oneflow radio in the bathroom which I bought fairly recently. I bought it because it has a DAB radio but it also accesses our network via wifi so I can stream all music off of our server. As it turns out it’s a bit rubbish and it only just about functions as a DAB radio, I bought two of these before I noticed that they’re a bit rubbish. Sean played me Dirty Water by the Standells and Dark and Stormy by Hot Chip. Neither really left a lasting impression, I’ve never heard of The Standells and I actively dislike Hot Chip. You can claim to have invented an indie rock/dance music hybrid all you like but if you can’t do either particularly well then just try and concentrate on one of them and practice. The only point of note here is how I know I listened to both of these. Fortunately I managed to find a web site (http://nowplaying.jameswragg.com/) that’s keeping a track of everything that’s playing on 6 Music. I used to use the what’s playing on 6 Music twitter account but that seemed to stop on the 15th April. I would like people to note that Sean talked a fair bit so I did have a fairly reasonable length shower. I was made redundant recently so have had a fair amount of time to listen to music and that will also explain why I wasn’t at work on a Tuesday. I’ve also been trying to work my way through 1001 Albums to Listen to Before You Die. As of Tuesday I was utterly in the middle of 1975 (actually as I write this I’m still utterly in the middle of 1975) so much of what I listened to was fairly dictated to me. The whole album listening thing was going to be a series of blog posts but I haven’t got round to it yet. Just about everything I listen to sits on our Synology Server, every device in the house can access the server and every device records everything I listen to on my Last FM profile. It does mean it’s a fairly easy to go back and look at what I listened to, and when I listened to it. Much of my music listening these days seems to be through the stereo in our conservatory, it’s stupidly hot and it’s just like sitting in the garden. We moved quite recently and I found an old Cambridge Audio amp and some Eltax speakers in the loft of our old house. 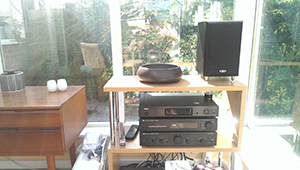 They still seem to work and I’ve added a Denon Media Streamer to be able to access the network and Last FM. Part of listening to albums from a book is you get a bit of a surprise when something you weren’t expecting (and something you know very well) turns up. My first album of the day was Led Zeppelin’s – Physical Graffiti, a true giant of an album and one I’m sure I haven’t listened to in years. After getting that out of the way I went over to Harborne to meet someone I used to work with. That meant getting in my nuclear heated car. When listening to music in the car I stream it straight off my phone. I’m probably alone in this but I think the A2DP Bluetoooth profile is one of the pinnacles of human ingenuity. For me it means that whenever I get in the car, my stereo detects my phone is close and automatically resumes playing music off of it. At the beginning of the week I tend to set up a really lengthy queue of music and just work my way through it as I travel about. 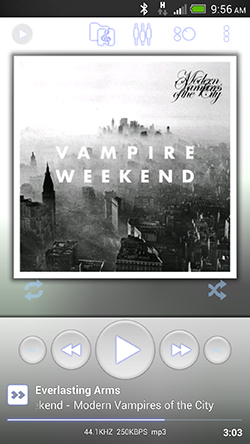 I use Poweramp to listen to music on my phone. It’s the only App I’ve found that works with A2DP properly and it has a really good pre-amp built into it. Going over to Harborne I got to listen to the end of Vampire Weekend’s new album, I bought it based on recommendation and seeing a bit of the gig they did at Glastonbury. They’re a band that I’ve never really understood and on listening to this album I’d say I still don’t. That was followed by Frank Turner’s Tape Deck Heart. I bought this months ago and just never got round to listening to it before. I wish I had, it’s great. I’m still not quite sure why I own it, I imagine it was an Amazon £4.00 deal on the day it was released and I just took a chance on it. To be honest I’m not sure I even know who Frank Turner is either. A trip to Harborne and back doesn’t quite cover two albums but I got through a fair bit of Frank Turner. Having devoted a fair amount of time to listening to 1001 Albums I’ve realised that it is really rare that you get to listen to something truly amazing that you’ve never heard before. Surprisingly I got home to get just that. I don’t think I’ve ever heard Keith Jarrett before (on reading about him I realise I must have heard him many times on Miles Davis records) and I’d certainly not listened to the 1975 Koln Concert before. An hour of improvised jazz that, in parts is astounding. At the beginning of the 1001 Albums chronology it was almost all jazz (it starts in the ’50s) but as I’ve hit the ’70s there has been less and less, it was nice to get some back. Over the next week Moseley will be hosting its annual festival (one of three festivals, we really like festivals) and I had agreed to post programmes through doors. This was a really stupid thing to volunteer for as the temperature and my level of fitness are not conducive to carrying and walking. It did give me an opportunity to listen to more stuff that’s queued on my phone. I have a pair of Sennheiser headphones that also use A2DP, so when I turn them on they instantly find my phone and resuming playing where the car left off. I love these headphones and can’t stress to you enough that you should get some. Whilst walking about I listened to the end of Frank Turner and Snarky Puppy album GroundUP that I bought at the weekend. I’d never heard of them until Sunday, but they played at the Mostly Jazz festival and were one of my highlights of the weekend. An almost perfect blend of jazz and funk, GroundUP is a great example and you should buy that as well. Another band I’d heard of, but wasn’t that familiar with was the The Haggis Horns but I got their Keep On Movin’s album and listened to it. Again, really good. My trip delivering stuff was slightly more jazz funk than I was expecting but that’s not dangerous, is it? Getting back to 1001 Albums was another album I hadn’t listened to in years, Aerosmith’s Toys in the Attic. They’re not a band I’d really consider listening to these days but Toy in the Attic is about their best. Walk This Way and Sweet Emotion are why they still get away with it. It doesn’t seem right that it came out 38 years ago. My last musical contribution of the day was David Bowie’s Young Americans, a much underrated album with a truly horrendous cover of Across the Universe on it.